Early Booking Offer – Book early to save up to 25% off the room rate. Please contact us for further details. 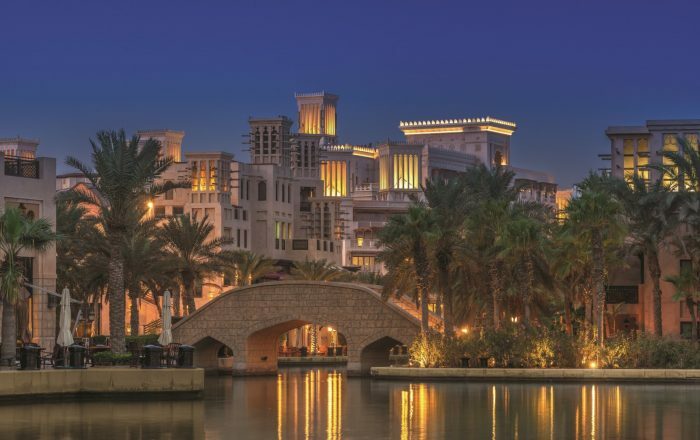 Jumeirah Al Qasr Dubai is a magnificently Arabian affair, offering a secluded luxury getaway that is full of opulent culture and excellent tradition. A palatial resort that is elevated above the Madinat, each moment is breathtaking and bewitching, and the lush gardens are beautifully lit and lined with palm trees. Extravagant fountains and gold statuesque horses grace Al Qasr’s entrance and guests are surrounded by glamorous tranquillity. Beautifully carved Arabian domes and arches feature heavily in each guestroom, and luxurious comforts are many. Gentle colours and ornate furniture decks each guestroom, elegantly displaying Arabian extravagance. Private balconies offer wonderful views of Dubai’s skyline and Madinat Jumeirah. Enjoy restful retreats at Talise Spa, indulging in massages and facials that will encapsulate you and invigorate your soul. Choose to dine indoors or al fresco, dining experiences at Al Qasr are mind blowing. An array of refreshing cocktails and finely chosen wines from around the world only add to the culinary journeys. Al Qasr is a well cultured resort that radiates lushness and is the epitome of comfortable, Arabian royal luxuries. Early Booking Offer – Book early to save up to 25% off the room rate. Complimentary Upgrade – Complimentary upgrade to Half Board available on applicable stays. Children Stay Free – Up to 2 children can stay for free when staying in a suite with parents. Surrender yourself in Talise Spa and relax. Therapy treatments are tailored to suit guests and each feels rejuvenating. Each spa treatment room is sympathetic to the guests needs for privacy and revitalisation. Sinbad’s’ Kids Club – Fun, lively activities are arranged daily to keep Al Qasr’s younger guests entertained. Rock climbing or dancing away at a disco, there is much to keep them amused. Wild Wadi Waterpark – Wild Wadi Waterpark has been designed to amuse guests of all ages. Whether enjoying the waterpark as a couple or family, the rides are relaxing or joyful, thrill seeking or calm. Souk Madinat – Visiting the Souk is a must. Be at peace with the Arabian culture and traditions and shop for Arabic ornaments and specialities. Hosting a variety of restaurants and bars, time is easily spent people watching at the Souk. Jumeirah Al Qasr, Dubai oozes regal Arabian riches from the moment honeymooners enter. Greeted by a cavalry of gold horses and elaborate dancing fountains, the lightly coloured Al Qasr glimmers in the Arabian sun and sets the mood for an intimate honeymoon. An exclusive luxury resort that has been designed to allow guests to experience Emirati generosity and Arabian extravagance, there is much to be enjoyed. Opulent facets of the spacious guestrooms include large regal bath tubs and walk in rain showers, luxurious textures and fabrics and private balconies that offer merciful views of Madinat Jumeirah. Culinary cuisines from across the world are served in ambient, comfortable settings, creating lasting memories. Zheng He’s – Cantonese cuisine is served using traditional cooking methods and adding a contemporary edge. Fusing eastern and western ingredients, each dish is tantalising. Honyaki – Honyaki serves sushi and sashimi that is fresh and healthy. Centimento – Offering endless panoramic views of Madinat Jumeirah, this rooftop bar is fantastic. Koubba Bar – Lively colours and entertainment makes Koubba Bar a great place to hang out. Shisha is served with refined cocktails and wines.